We will do our best to accommodate your busy schedule. Call us at 724-547-5711 or click the link below to schedule an appointment today! Dr. H. Arnold Papernick serves Mt. Pleasant and Surrounding areas for nearly 50 years! 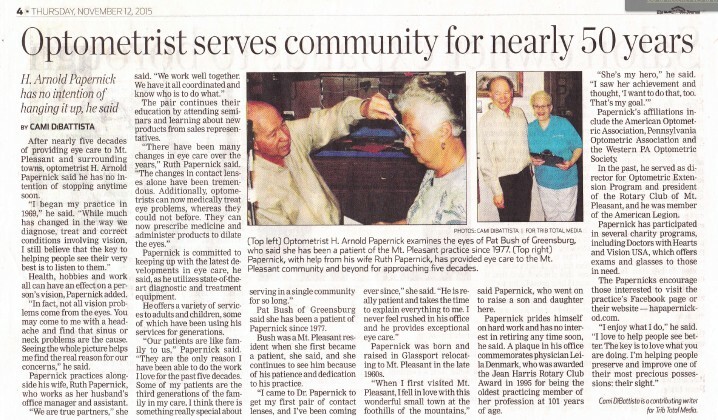 Click the image below to read more about Dr. Papernick's personalized approach to eyecare for every one of his patients! Your Optometrist in Mt Pleasant, PA.
We are celebrating nearly 50 years of Eye Care Excellence! Call us at 724-547-5711 today. Dr. Papernick and our entire staff here at H. Arnold Papernick OD in Mt Pleasant, PA welcome you! Our Mt. Pleasant optometrist has been providing high-quality eye care in the area since 1969. We have accomplished this through a unique combination of old-fashioned personal attention with the latest technological advances in eye care. You will enjoy our comfortable, professional environment, as well as the exceptional personal care during each visit. Dr. Papernick provides full-service vision and eye care including eye exams, condition management, pre- and post-operative care, emergency eye care, and more. One of the things people love about coming to H. Arnold Papernick OD is the unhurried atmosphere. During your appointment, Dr. Papernick will spend all the time necessary to give you the most thorough exam while explaining all the procedures and answering any questions you may have. Our goal is to ensure your eye care and vision care needs are completely satisfied! Your eyes provide an important window into the status your overall health, as well as your level of visual perception. This is why it is so important to schedule a regular eye exam. 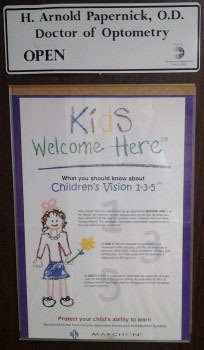 Eye exams with Dr. Papernick are both comfortable and comprehensive. He will fully examine the health of your eyes and note any symptoms that may indicate other health complications. He also does complete vision tests that measure how well you are able to see under all types of light conditions. If we determine that you need glasses or contacts, our team will work directly with you to find the right frames to accentuate your face! We realize that everyone has a busy schedule these days, so you can schedule your appointment with our Mt. Pleasant optometrist online, or call just us at 724-547-5711. We will do our best to find a time that works for you. We also understand that there are times when you have an eye emergency that needs immediate attention, even outside of office hours. If you have an eye emergency, call us right away at (412) 610-0761 for assistance. As a highly-respected and skilled optometrist in Mt. Pleasant since 1969, we are able to provide financing options to fit your needs and work with a wide range of eye care insurance policies and providers. Call us today at 724-547-5711. We look forward to working with you! 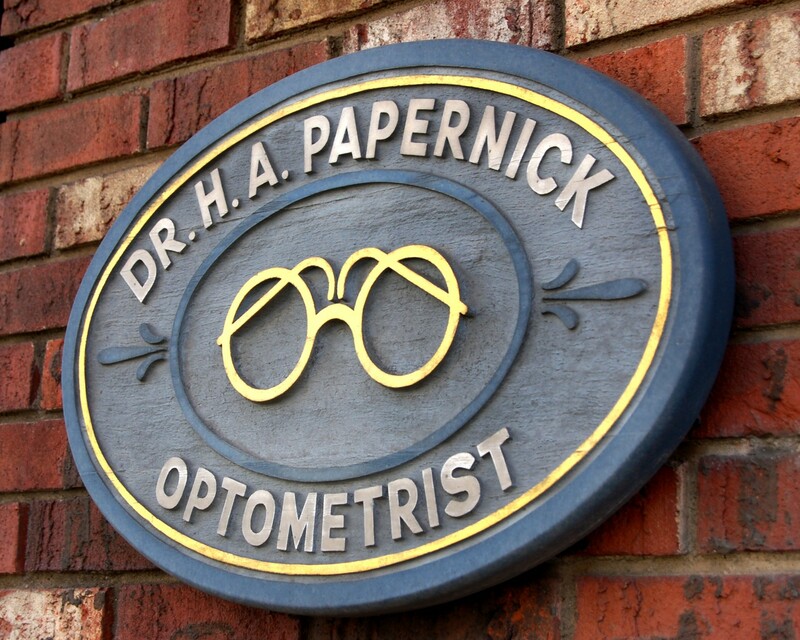 "No optometrist I've ever been to has been as welcoming and thorough as Dr. Papernick and his staff. I've felt instantly at home there since Day One. It is easy to schedule an appointment and the staff is very professional upon arrival. I've always received thorough explanations of the procedures and decisions he is making. You will also find a wonderful selection of frames and accessories there. There is no one I'd rather trust my vision to than Dr. Papernick."